USA - Pearl Jam very recently wrapped up a sold-out, two-month sweep of North American arenas in support of its tenth and latest studio album, Lightning Bolt. 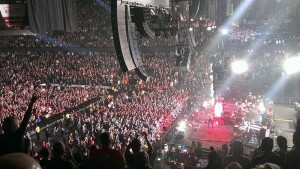 The outing marked the Seattle-based rock band’s first official return to the tour circuit since 2010, and, as it did then, the group carried a full L-Acoustics K1 system supplied by Rat Sound Systems, Inc.
Rat Sound’s relationship with Pearl Jam goes back to the band’s debut album, Ten (1991), when it opened for one of Rat’s other longtime accounts, Red Hot Chili Peppers. Since then, the company has served as the group’s primary live production provider. According to Rat Sound’s Kevin McKenzie, who has served as Pearl Jam’s system tech for the past decade, the PA deployed at each stop typically featured 14 K1 plus six Kara downfills per side with adjacent hangs of a dozen K1-SB. Additional left and right side hangs both comprised ten K1 and six Kara, while four more arrays of 15 Kara each provided the 270- and 360-degree reinforcement positions for most venues. To augment the low end provided by the flown K1-SB arrays, eight SB28 per side were ground-stacked in front of the stage, with eight Arcs II enclosures and six self-powered 108P coaxials providing front-fill. The entire system was driven by LA8 amplifiers and controlled via L-Net. In picture: Pearl Jam performing at Calgary, Alberta’s Scotiabank Saddledome on 2nd December 2013. photo: Warren Hope, Calgary.